This may be a little deep for what’s entailed to come and maybe Nelson Mandela and I were not the greatest of friends. Nevertheless, stuffing an OREO into a chocolate chip cookie was a brilliant yet terrifying venture. First, I contemplated whether the cookie was going to be too big. Is there such a thing? Then, I was nervous that the OREO’s frosting would melt and ruin the cookie’s shape. I was ready to give up when the cookie dough wasn’t sticking to the OREO. But this is of course has a happy and delicious ending. I have figured out all the tricky logistics. You’re welcome. The cookies were a success and I’m ready to share! Are you up for the challenge? 1. Preheat the oven at 350 F. Line a baking sheet with parchment paper. 2. In a mixing bowl, beat the butter and sugars until well combined. 3. Add in the egg and vanilla extract and mix well. 4. In another mixing bowl whisk together the flour, salt and baking soda. 5. Gradually add this dry mixture into the wet mixture, along with chocolate chips, until combined. 6. Flour your hands lightly so the dough doesn’t stick to your hands and so it is easy to work with. Take a scoop of the dough and place on top of the OREO cookie. Take another scoop and place on the bottom of the OREO cookie. 7. 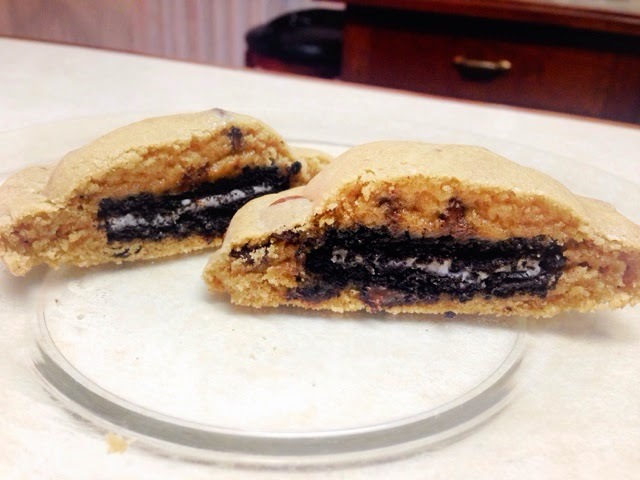 Press lightly between your palms and seal the edges together by pressing and cupping the cookie on your palm.The oreo cookie should be completely inside the dough with all the edges sealed. 8. Place the cookies on the prepared baking pan, an inch apart. 9. Cool in the refrigerator for 5-10 minutes if you don’t want the cookie to get spread a lot. 10. Bake for 10-12 minutes or until the sides start turning brown. 11. Cool in the baking pan for at least 5 minutes. 12. Transfer them to a wire rack and cool completely before you store them in an air tight container. Enjoy! Prev 10 Things You Should Never Feel Bad For!